Pioneers in the industry, we offer fume hood, chemical fume hood, lab fume hood and suction fume hood from India. We are the Leading Manufacturer and Exporter of Fume Hood in Coimbatore, India. 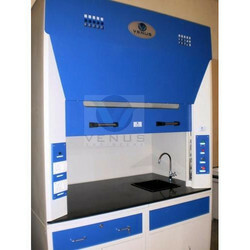 Leveraging on the rich industry experience, we have been able to put forth the clients robustly constructed Fume Hood. Fabricated using superior-grade components such as stainless steel, the range is widely used for throwing out harmful & toxic fumes. Owing to this, the range is used for providing protection from toxic gases eliminated by ducting of exhaust blower. We are the Leading Manufacturer and Exporter of Chemical Fume Hood in Coimbatore, India. Backed by the wide distribution network and proficient personnel, we are able to offer an unparalleled range of Fume Hood. 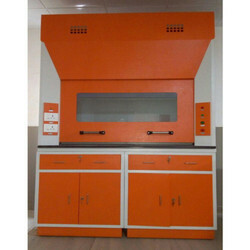 The offered range of fume hood is high in demand in domestic as well as international marketplace all across the world. In order to optimize airflow and to give best dilution and extraction of harmful fumes, we have designed and developed our bypass fume cupboard. We are the Leading Manufacturer and Exporter of Lab Fume Hood in Coimbatore, Tamilnadu, India. We are offering to our clients a wide range of Lab Fume Hood, designed specifically by giving special attention to every detail in the design using premium quality raw material. These hoods are manufactured in compliance with the industrial standards. Our range of hoods is especially appreciated by our patrons for their ability to serve a number of industries. 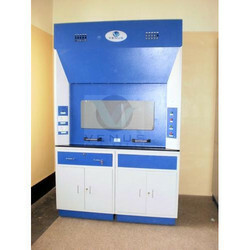 We are the Leading Manufacturer and Exporter of Bench Type Suction Fume Hood in Coimbatore, India. We are a prominent name, which is engaged in delivering in offering Bench Type Fume Hood. Fume hood are used to protect the persons and eliminate the toxic gases ducting by exhaust blower.This laboratory fume hoods can also be customized as per the requirements of our clients.